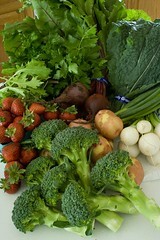 What's in Season at Your CSA? This article was written by past Local Food Program Director, Steve Russell. Community-Supported Agriculture is a produce distribution method where farmers, or groups, build a network of Members that share the cost and harvest of a given food system. 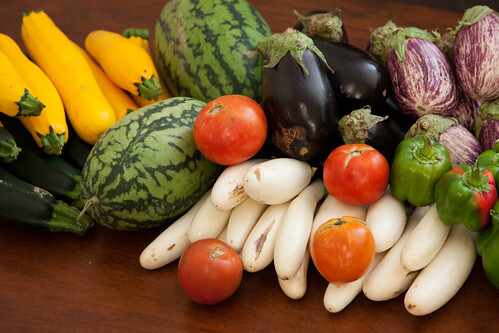 In turn, members receive a regular “share” of the best, seasonal, farm-fresh produce available on the farm. The contents of your basket will vary significantly from share to share, season to season, which provides both the challenge and the opportunity to try out new types of produce. The Opportunity: By choosing to spend your produce dollars with a locally operated CSA, you decrease your family’s environmental impact overall and shift your food dollars to small, local growers (this arrangement usually saves both you and the farmer money. Woohoo!). Also, CSAs will ONLY serve what is ripe and ready, thus Members get the best, freshest pick off the farm—and sometimes that includes surprise heirlooms. All in all, CSAs are a fun, innovative way to shift the way you shop that will expose you and your family to all sorts of new foods! Overall, CSA memberships are mutually beneficial for both farmers and consumers. For the farmers, the arrangement offers stability in the form of a regular, reliable, monthly income. It also significantly decreases the potential for shortages and surpluses to harm a farmer’s livelihood. And for you, the consumer, choosing a CSA promises your family an enriched relationship with the food you eat and the place it comes from. Just make sure to do your research! All are priced and arranged differently and CSAs will often provide different types of products; so, while most will offer fresh vegetables & fruits, others will offer meats, eggs, dairy or even fresh-baked dog treats and beauty products! There are nine CSA Members in the Local First Arizona network. Show them some local love, by subscribing!